Nephropathy, a major complication of diabetes, is the leading cause of end-stage renal disease. Recent studies have demonstrated that podocyte injury is involved in the onset of and progression to renal insufficiency. Here, we describe a novel, highly sensitive ELISA for detecting urinary podocalyxin, a glycoconjugate on the podocyte apical surface that indicates podocyte injury, particularly in the early phase of diabetic nephropathy. Urine samples from patients with glomerular diseases (n = 142) and type 2 diabetes (n = 71) were used to quantify urinary podocalyxin by ELISA. Urine samples were obtained from 69 healthy controls for whom laboratory data were within normal values. Podocalyxin was detected in urine by immunofluorescence, immunoelectron microscopy and western blotting. Morphologically, urinary podocalyxin was present as a vesicular structure; western blotting showed it as a positive band at 165–170 kDa. Levels of urinary podocalyxin were elevated in patients with various glomerular diseases and patients with diabetes. 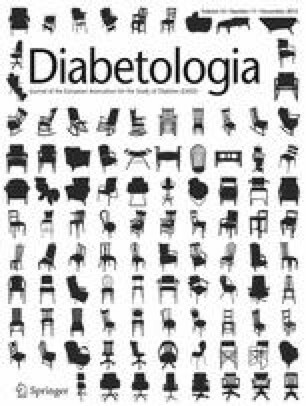 In patients with diabetes, urinary podocalyxin was higher than the cut-off value in 53.8% patients at the normoalbuminuric stage, 64.7% at the microalbuminuric stage and 66.7% at the macroalbuminuric stage. Positive correlations were observed between urinary podocalyxin levels and HbA1c, urinary β2 microglobulin, α1 microglobulin and urinary N-acetyl-β-d-glucosaminidase, although urinary podocalyxin levels were not correlated with other laboratory markers such as blood pressure, lipid level, serum creatinine, estimated GFR or proteinuria. Urinary podocalyxin may be a useful biomarker for detecting early podocyte injury in patients with diabetes. The online version of this article (doi: 10.1007/s00125-012-2661-7) contains peer-reviewed but unedited supplementary material, which is available to authorised users. Nephropathy is a major complication of diabetes and the leading cause of end-stage renal disease; it is clinically characterised by proteinuria and progressive renal insufficiency . Human podocytes (Pods) have been demonstrated to be functionally and structurally injured in the natural history of diabetic nephropathy . Recently, an increase in foot-process width has been identified in patients with type 1 diabetes and microalbuminuria, and foot-process width has been shown to correlate directly with the urinary albumin excretion rate . Furthermore, the number and density of Pods have been reported to be markedly reduced (podocytopenia) in patients with diabetes . Pods are located outside the glomerular basement membrane (GBM). Because of the proximity of the apical region of Pods to the urinary space, pathological events occurring in this region are expected to be more easily detectable in urine than those occurring in the basal or slit diaphragm regions of Pods [5, 6]. In this study, we report the establishment of a highly sensitive ELISA for the detection of urinary (u)-podocalyxin (PCX), one of the primary glycoconjugates on the Pod surface, for identifying Pod injury in various glomerular diseases, particularly in the early phase of diabetic nephropathies. Urine samples from patients with glomerular diseases (n = 142) and type 2 diabetes (n = 71) were used for u-PDX quantification by ELISA. Urine samples were obtained from 69 healthy controls with laboratory data within normal values. Urine samples were obtained from urine voided in the morning, and were stored at −70°C within 2 h of collection until quantification by ELISA. The clinical characteristics of the patients and healthy controls are shown in Tables 1 and 2. This study was approved by the ethics committees of all the hospitals involved. Informed consent was obtained from patients. We used two series of monoclonal antibodies in this study: antibodies against native human PCX; and antibodies against recombinant PCX. Monoclonal antibodies against native human PCX were produced using, as the immunogen, native PCX prepared from isolated glomeruli. The glomeruli were isolated from the normal portion of the kidneys obtained during nephrectomy. Isolated glomeruli were extracted in 0.2% (vol./vol.) Triton X-100 in PBS containing protease inhibitors. The extract was then incubated with wheat germ agglutinin (WGA)–Sepharosel; after washing, the sialic-acid-rich material that bound to the WGA column was removed with N-acetyl-β-glucopyranoside. BALB/c mice were immunised with 50 μg WGA-bound PCX. Spleen cells were fused according to standard procedures. Clones producing anti-PCX antibody were screened by indirect immunofluorescence (IF) on cryostat sections of human kidney and were further characterised by western blot analysis and immunoprecipitation. A number of positive clones were identified. Finally, three clones (22A4, 3H11 and 4D5) were obtained and confirmed as monoclonal antibodies against native human PCX . The monoclonal antibodies against recombinant PCX were produced using purified recombinant human PCX–glutathione transferase (GST) fusion protein, according to the method described by Kershaw et al  (electronic supplementary material [ESM]). BALB/c mice were immunised with purified recombinant human PCX–GST fusion protein prepared by PCR amplification of the cDNA for base pairs 1004–1835 of the human PCX (named PC-46, and containing both intracellular and extracellular domains) by the standard method. The resulting hybridomas were cultured in 96 well plates and screened with an ELISA using polystyrene multi-well plates coated with a WGA-binding fraction in a Triton X-100 glomerular lysate. The PCX–GST fusion proteins obtained using cDNA coding for parts of the extracellular and intracellular domains of human PCX (named PC-35 and Intra PC, respectively) were used to characterise the monoclonal antibodies. The monoclonal antibodies against native PCX and recombinant PCX were further characterised using the following methods. Polystyrene multi-well plates were coated with PC-46, PC-35 and Intra PC. The plate was incubated with various monoclonal antibodies at 37°C for 1 h. After washing, the plate was further incubated with horseradish peroxidase (HRP)-labelled anti-mouse IgG (Cappel, Chester, PA, USA). HRP conjugation and incubation were performed according to standard methods. Samples from the human glomerular lysate and GST–PC-46, GST–PC-35 and GST–Intra PC were separated by 5–15% (wt/vol.) SDS-PAGE under reducing conditions. They were then transferred to polyvinylidene difluoride (PVDF) membranes and incubated for 1 h at room temperature with monoclonal antibodies against PCX. The membrane was incubated with anti-mouse IgG labelled with HRP (Dako Japan, Tokyo, Japan), and finally visualised using diaminobenzidine. We used a stable human PDX cell line to identify the subcellular localisation of epitopes recognised by the monoclonal antibodies against PCX. Human embryonic kidney (HEK)-293 cells were transfected with cDNA encoding human PDX, as described previously . To determine the intracellular localisation of the epitope, HEK-human plasma cell antigen-1 (HPC1) cells were permeabilised with 0.05% (vol./vol.) Triton X-100 in PBS for 5 min. To determine the extracellular localisation, the cells were used without permeabilisation. The cells on the slide glass were incubated with blocking buffer and then processed for IF. Alexa-Fluor-488-conjugated goat anti-mouse IgG (Molecular Probes, Eugene, OR, USA) was used as the secondary antibody. The cells were also stained with rhodamine-labelled phalloidin. For immunoblot analysis, HEK-HPC1 cells were lysed in lysis buffer on ice with a Dounce homogeniser, and the lysates were separated using 7.5% (wt/vol.) SDS-PAGE under reducing conditions. Lysates were then transferred to PVDF membranes and incubated with antibodies. The filters were then incubated with HRP-labelled goat anti-mouse Ig (Dako, Carpinteria, CA, USA) and developed using a chemiluminescence kit (Life Science Products, Boston, MA, USA) according to the manufacturer’s instructions. Human kidney segments were sectioned using a cryostat for subsequent analysis by indirect IF using the primary antibodies and FITC-labelled anti-mouse IgG (Cappel, Chester, PA, USA) as the secondary antibody. The commercially available antibody Prince Henry Hospital Melbourne (PHM)5 was used as the positive control . To construct a sandwich-type ELISA, the protein-G-bound fraction from ascitic fluid was used as the capture antibody for ELISA plates and was labelled with HRP. Two clones recognising the intracellular peptide region (no. 147 for the capture antibody and #5 for the tracer antibody, named using the system used in our previous publications) were chosen for ELISA after trials using seven antibodies in various combinations. To construct a standard curve, Intra PC was used as a standard antigen. The urine was diluted with PBS, and Triton-X was then added to 0.2% (vol./vol.) of final concentration. ELISA was performed with the 100 μl treated urine samples. The concentration of PCX was standardised by creatinine concentration and was expressed as ng/μmol creatinine. Urine samples were centrifuged at 1,710 g for 5 min to remove cellular components; the supernatant fraction was then subjected to centrifugation at 435,000 g for 2 h. The precipitates were air-dried on the glass slide, and conventional IF staining was performed using the monoclonal antibodies against PCX as the primary antibodies and FITC-labelled anti-mouse IgG (Cappel) as the secondary antibody. To detect PCX in the human glomerular lysates and urine samples, the precipitates obtained after centrifugation (as described above) were analysed by western blotting. The proteins in the sample were separated on 5–20% (wt/vol.) SDS-PAGE, and then transferred onto a PVDF membrane (Millipore, MA, USA). The membrane was first overlaid with anti-PCX monoclonal antibody, followed by anti-mouse IgG labelled with HRP (Dako Japan) and finally visualised with diaminobenzidine. This immunoelectron microscopy (IEM) study using magnetic beads was used to examine PCX-positive vesicles in urine samples from two patients (normoalbuminuric and microalbuminuric). The supernatant fraction obtained from the urine samples after centrifugation at 1,710 g was concentrated using Vivaspin (Sartorius, Goettingen, Germany); it was then treated with magnetic particles covalently coated with rabbit anti-mouse antibody (Dynabeads M-280; Dynal Biotech ASA, Oslo, Norway). The binding of magnetic particles to the anti-PCX antibodies (22A4) was performed according to the manufacturer’s instructions. The monoclonal-antibody-coated particles (100 μl) were incubated with the concentrated urine sample (100 μl) for 2 h at 4°C. After extensive washing, the magnetic particles were fixed in 2% glutaraldehyde, dehydrated and processed for IEM examination. All data are expressed as the mean ± SEM. Comparisons between the groups were performed by the Mann–Whitney test. The relationship between the groups was analysed by calculating Spearman’s rank correlation coefficients (rs). Differences between groups were considered to be statistically significant when p < 0.05. ELISA revealed that clone 22A4 (antibody against native PCX) was not reactive with PC-46, PC-35 or Intra PC. Clones #45 and #9 were reactive with PC-46 and PC-35 but not with Intra PC. Clones 70-4, #5, #16, no. 44 and no. 147 were reactive with PC-46 and Intra PC, but not with PC-35. In western blot analysis (Fig. 1a) all of the clones showed 160–170 kDa bands when glomerular lysate was used as a sample. Clone 22A4 showed no bands when PC-46, PC-35 and Intra PC were used as samples. Clones 70-4, #5, #16, no. 44 and no. 147 showed 34 and 56 kDa bands when Intra PC and PC-46 were used as samples, respectively, but no bands when PC-35 was used. Clones #45 and #9 showed 44 and 56 kDa bands when PC-35 and PC-46 were used as samples, respectively, but no bands when Intra PC was used. In analysis using cultured cells (Fig. 1b), IF revealed positive staining with clones #45 and #9 when non-permeabilised cells were used. However, when permeabilised cells were used, clones 70-4, #5, #16, no. 44 and no. 147 were positive. Western blot analysis demonstrated a 170 kDa band with each clone. IF revealed that clones 22A4, #45, #9, 70-4, #5, #16, no. 44 and no. 147 showed almost identical staining patterns: bright glomerular staining and faint staining of the endothelial cells of blood vessels (Fig. 1c). These findings were same as those for PHM5, which was used as a positive control. The results of the above four experiments indicate that 22A4 did not recognise the peptide portion of PCX; clones #45 and #9 recognised the extracellular portion of PCX, and clones #5, #16, no. 44, 70-4 and no. 147 recognised the intracellular portion of PCX. Eventually, seven monoclonal antibodies (two recognising the extracellular portion and five recognising the intracellular portion of PCX) were identified for use in ELISAs. u-PCX was found as granular structures in the urine precipitates following ultracentrifugation at 435,000 g of urine samples from patients with diabetes (Fig. 2a). IEM revealed that u-PCX of patients with diabetes was present in the vesicular form (Fig. 2b), similar to that present in samples from patients with glomerular disease such as IgA nephropathy . The presence of PCX was confirmed by western blot analysis. The precipitate obtained after centrifugation at 435,000 g contained a typical PCX band at 165–170 kDa. Degradation products of smaller sizes were also observed with #5. No band was observed with the control antibody (monoclonal antibody against norovirus [NV]) and PBS. Representative findings from urine samples from patients with diabetic nephropathy and IgA nephropathy are shown in Fig. 2c. The ELISA provided a linear plot covering a range of 12.5–800 ng/ml. The detection limit for this ELISA assay was 6.25 ng/ml. The upper limit of u-PCX from healthy individuals was 148 ng/μmol creatinine (mean +2 SDs). The intra- and inter-assay coefficients of variation were 3.5% and 8.4%, respectively. The spiking recovery rate was 91.9%. The levels of u-PCX in IgA nephropathy (14.4 ± 1.0 ng/μmol creatinine), lupus nephritis (44.3 ± 10.8 ng/μmol creatinine), minimal change nephrotic syndrome (MCNS)/focal segmental glomerulosclerosis (FSGS) (37.1 ± 11.7 ng/μmol creatinine), diabetic nephropathy (27.3 ± 3.3 ng/μmol creatinine) and lupus nephritis (LN)/membranous nephropathy (MGN) (71.4 ± 23.8 ng/μmol creatinine) were significantly higher in comparison with those in the control individuals (p < 0.001 for all), while levels in the other glomerular diseases (12.1 ± 3.1 ng/μmol creatinine) were not significantly increased (Fig. 3a). In participants with diabetes, the levels of u-PCX in those with normoalbuminuria (20.7 ± 2.7 ng/μmol creatinine), microalbuminuria (26.5 ± 4.7 ng/μmol creatinine) and macroalbuminuria (45.3 ± 12.2 ng/μmol creatinine) were significantly increased in comparison with those in the controls (p < 0.001 for all). Further, u-PCX levels above the cut-off value were noted in 53.8% patients in the normoalbuminuric stage, 64.7% in the microalbuminuric stage and 66.7% in the macroalbuminuric stage. In patients with diabetes, positive correlations were found between u-PCX level and HbA1c (rs = −0.25, p < 0.05), urinary albumin (rs = 0.35, p < 0.01), urinary β2 microglobulin (rs = 0.55, p < 0.001), urinary α1 microglobulin (rs = 0.42, p < 0.001), and urinary N-acetyl-β-d-glucosaminidase ([NAG] rs = 0.65, p < 0.001), although the u-PCX level was not correlated to the other laboratory markers such as systolic BP (SBP), diastolic BP (DBP), total cholesterol, triacylglycerol, HDL-cholesterol, serum creatinine, estimated GFR (eGFR) or proteinuria. By performing a novel ELISA technique using monoclonal antibodies against PCX, we observed elevated levels of u-PCX in urine samples from patients with various glomerular diseases as well as in patients with diabetes, compared with those in normal controls. Interestingly, elevated levels of u-PCX were observed in the normoalbuminuric group, with 53.8% of normoalbuminuric patients having values over the cut-off. A recent report revealed that morphological alterations are present in Pods in the microalbuminuric stage; however, such observations have not been reported in normoalbuminuric patients. The present study clearly demonstrated that Pod injury is present before the appearance of microalbuminuria in patients with diabetes. Thus, the quantification of u-PCX could be used as an early indicator of glomerular tuft dysfunction. Microalbuminuria is an early clinical marker of diabetic kidney disease resulting from damage to the glomerular filtration barrier, which comprises endothelial cells, GBM and Pods . The presence of microalbuminuria indicates the involvement of all of these three components in filtration-barrier injury. PCX is one of the specific markers for Pods; therefore, the presence of u-PCX reflects specific Pod injury that is unrelated to the other two elements. It appears reasonable that Pod injury alone is present before the appearance of microalbuminuria. Several recent studies have focused on the production of Pod-specific proteins in patients with diabetes and have attempted to detect earlier functional abnormalities in Pods. For instance, in type 1 diabetes, nephrin excretion in the urine (nephrinuria) has been detected by western blot in the normoalbuminuric stage . Injuries to Pods (i.e. podocytopathies) include cellular hypertrophy, foot-process effacement, detachment from the GBM and apoptosis. In addition to these changes, microvillous transformations appear on the apical cell surface of the injured Pod. Previously, we have demonstrated that vesicles from the apical cell surface are shed into urine because of tip vesiculation of microvilli, with u-PCX reflecting the urinary shedding of microvilli; we also determined this phenomenon to be common in glomerular diseases . In the present study, we provide evidence for this phenomenon in patients with diabetes by demonstrating the presence of vesicles in urine using anti-PCX antibodies in IF and IEM. Further, such shedding of vesicles and the subsequently elevated levels of u-PCX are markedly manifested in glomerular diseases with severe Pod damage, such as nephrotic syndrome, including FSGS, MGN and lupus nephritis. High levels of u-PCX can thus be considered to reflect marked microvillous transformation and vesicular shedding . Regarding the significant levels of u-PCX in the normal controls, a small amount of vesicles might have been shed by microvilli into the urine of the normal controls by normal physiological turnover, as microvillous transformation is found occasionally on the normal glomerulus. We observed a significant correlation between u-PCX levels and HbA1c and urinary albumin levels. This might indicate that a hyperglycaemic state causes glomerular capillary-barrier damage, as demonstrated by the increased excretion of u-PCX and albuminuria. In contrast, the serum creatinine levels and eGFR did not correlate with u-PCX levels. Changes in serum creatinine levels and eGFR typically reflect deranged renal function only in the advanced stages of the kidney disease—when functioning nephrons are lost—not in the earlier stages. If the presence of u-PCX reflects Pod injury in the earlier stages of kidney disease, the lack of correlation between serum creatinine/eGFR and u-PCX levels is understandable. Interestingly, the levels of u-PCX were closely correlated with the levels of other urinary indicators of tubular damage, such as β2 microglobulin, α1 microglobulin and NAG. Although it was previously considered that tubular damage follows glomerular damage, recent studies have demonstrated that tubular damage occurs in the early stages of diabetic nephropathy [14, 15]. The present study also demonstrated that u-PCX levels are increased in the early stage of diabetic nephropathy, even in the presence of normoalbuminuria. Considering these data together, it is likely that inflammatory stimuli, including the hyperglycaemic state, may cause glomerular as well as tubular damage in the early stages of diabetic nephropathy. In conclusion, we have established a highly sensitive ELISA for detecting u-PCX, which indicates Pod injury. u-PCX may be a useful biomarker for the early detection and monitoring of diabetic nephropathy as well as other glomerular diseases. The authors thank W. E. Smoyer for his thoughtful review of this manuscript. Editage provided editorial and publication support. This study has been reported, in part, as a free communication at the 2009 American Society of Nephrology National Meeting, San Diego, CA, USA. All authors contributed towards the conception and design of the study; analysis and interpretation of data; and drafting the article and revising it critically for important intellectual content. All gave final approval of the version to be published.